The peripheral nervous system (PNS) refers to all the neurons (and their supporting cells, or glia) of the body outside the brain and spinal cord (central nervous system [CNS]). The brain is the organ that decides how a person responds to what happens in the surrounding world. While this is an extremely important function, the brain relies upon the peripheral nervous system, and its information gathering capabilities, to receive information about the world and to send appropriate responses to various body parts, such as muscles and glands. The neurons of the peripheral nervous system do not make complex decisions about the information they carry. The appropriate decisions are made instead in the brain and spinal cord. However, without the peripheral nervous system's ability to bring in sensory information and send out motor information, it would be impossible for a person to walk, talk, ride a bike, or even watch television. Without the ability to take in information and send out responses, the brain would be useless. Peripheral neurons are of two types, sensory and motor. Sensory (afferent) neurons bring information about the world within and around the body from sense organs to the brain and spinal cord, while motor (efferent) neurons carry messages from the brain and spinal cord out to the muscles and glands. For example, if a mosquito lands on a person's arm, sensory neurons in the skin send a message to the spinal cord and then the brain, where the message is understood, and a reaction formulated. The brain's response may be to use motor neurons to cause muscle contractions resulting in a slap on the skin where the mosquito landed. The sensory division of the PNS carries all types of sensory information to the CNS, including that from the "special senses" of touch, smell, taste, hearing, and sight, as well pain, body position (proprioception), and a variety of visceral sensory information. The information from the viscera (internal organs) includes some of which the body is aware (bladder fullness and stomach aches, for example), as well as much of which the body is not aware, including blood pressure, concentration of substances in the blood, and many other bits of sensory information used to regulate the internal environment. 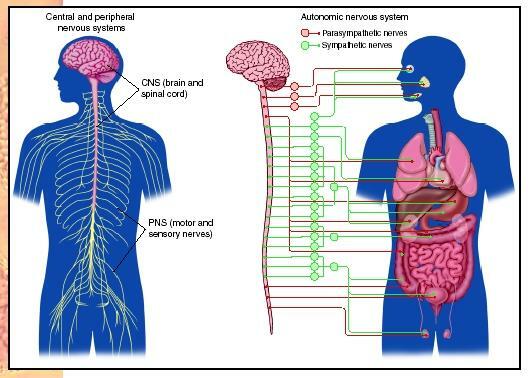 The central and peripheral nervous systems (left) and the autonomic nervous system (right). The motor division of the PNS is subdivided into several branches. The somatic motor branch carries voluntary (willed) commands to the skeletal muscles, allowing a person to perform such action as swatting a mosquito or sticking out the tongue. The autonomic motor branch carries autonomic (automatic, or unwilled) commands to a variety of muscles and glands throughout the body, allowing the brain to control heart rate, blood pressure, breathing rate, sweat production, and hormone release, among other functions. Much like a car, which has both a gas pedal and a brake to give the driver very precise speed control, the autonomic nervous system can be subdivided into two parts, the sympathetic and the parasympathetic. The sympathetic part of the autonomic nervous system generally acts in opposition to the parasympathetic part. So while the sympathetic motor neurons speed up the heart, the parasympathetic motor neurons will slow it down, and while the sympathetic motor neurons slow down digestion, parasympathetic motor neurons speed digestion. When a person is frightened, for example, sympathetic motor neurons trigger adrenaline release, increase the heartbeat and blood pressure, close off blood vessels to the gut and open them to the skeletal muscles, dilate the pupils, and open the airways. Combined, these are known as the "fight or flight" response, since they prepare the body for rapid action. Afterward, parasympathetic neurons reverse these actions, bringing the body back to a more peaceful resting state. Some of the somatic sensory neurons are very long, stretching from the sensory receptors all over the body all the way into the spinal cord, or even directly into the brain. Likewise, a single somatic motor neuron spans the distance from the spinal cord or brain to whichever muscle it operates, even if that is the muscle controlling the big toe. Autonomic motor neurons are not as long, and usually two neurons are needed to stretch from the spinal cord to the muscle or gland being turned on or off. Many of the connections among neurons in the peripheral nervous system are made in special structures called ganglia (singular, ganglion). Most ganglia are large collections of connecting neurons located in specific regions of the body, and are part of the autonomic nervous system. In some cases, the ganglia are located close to the spinal cord, and thus close to the target organ. Greenfield, Susan A. The Human Mind Explained. New York: Holt and Company, 1996. Martini, F. H., and E. F. Bartholomew. Structure and Function of the Human Body. Upper Saddle River, NJ: Prentice Hall, 1999. Scott, A. S., and E. Fong. Body Structures and Functions, 9th ed. New York: Delmar Publishing, 1998.